Here’s a Tinder profile you'll want to swipe right on. The world’s last male northern white rhino, “Sudan,” has recently joined the dating app, but he’s not looking for a hookup. Instead, Tinder has partnered with Kenya’s Ol Pejeta Conservancy to help spread awareness and raise money for the endangered species. “We partnered with [the conservancy] to give the most eligible bachelor in the world a chance to meet his match,” Tinder’s head of communications Matt David said in a statement. Users in 140 countries have the opportunity to swipe right on the one-of-a-kind bachelor. 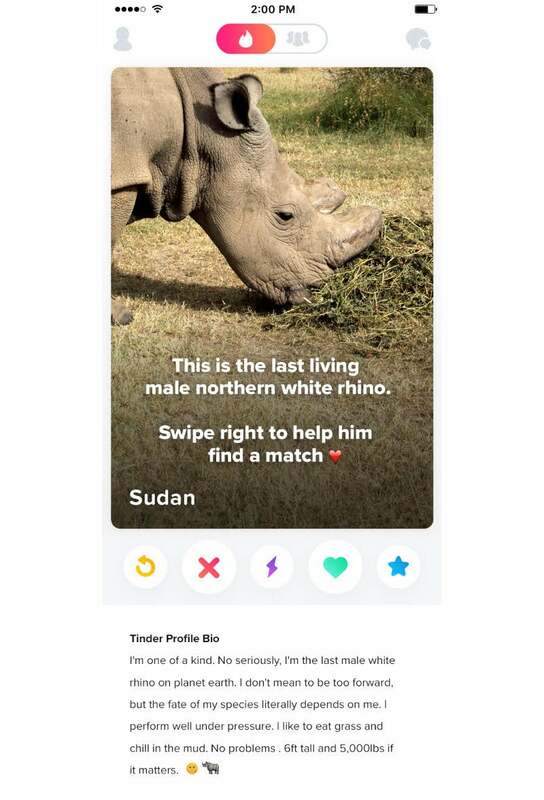 And after a user swipes right, they’ll receive a message giving them the opportunity to make a donation to help save the northern white rhino from extinction. However creative the new fundraising strategy is, the issue is very serious. Right now, Sudan lives at the Kenyan conservancy, where he is protected 24/7 by armed guards. There are two other northern white rhinos, both female, remaining on the planet who also live at the conservancy. Unfortunately, all efforts to breed have not been successful. "We tried everything to get them to mate naturally," said Elodie Sampere, the marketing manager at Kenya's Ol Pejeta conservancy. Now, to preserve the species, the “last option” is in vitro fertilization (IVF), which will cost a whopping $9 million. That's why the conservancy is doing everything it can to raise money -- even getting support from a dating app.